With the help of an attorney, you can include language in your will or trust specifying a gift to Carolina Tiger Rescue. You may include Carolina Tiger as a primary beneficiary or a contingent beneficiary. When naming Carolina Tiger Rescue as a beneficiary of your will or trust, please use the following designation. Please note that our legal name is Carolina Tiger Rescue. Our Taxpayer Identification Number (TIN) is: 56-1522499. 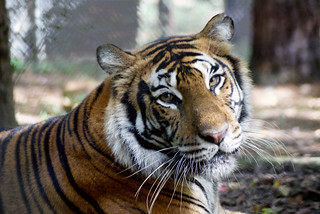 If you do include Carolina Tiger Rescue in your will or trust, please let us know so that we may thank you and include you among our Sanctuary Stewards. For more information about making a bequest to Carolina Tiger Rescue, please contact Heidi Zangara, Planned Giving Manager.